A mezuzah is kosher only if written in accordance with the laws of halacha. It must be handwritten in ink on parchment, with all characters correctly written. This must be done by a sofer STAM who is experienced and knowledgeable in the halacha, with dedication to holy writing and the intention of performing the mitzvah of mezuzah writing. It is important of course to have a certified examiner inspect each and every mezuzah before use. If one of these conditions is not met, the mezuzah is invalid. Therefore, a mezuzah must be purchased only from a reliable source. Reliability cannot be assessed by the length of beard worn by the salesperson… I recently came across an incident where an apparently observant individual had sold mezuzot which all turned out to be worthless! The size of the parchment is irrelevant, although a very small parchment impedes meticulous writing. Therefore, it is highly recommended not to purchase a mezuzah less than 10 cm. (4”) high. Ashkenazi, Chassidic, and Sephardic writing styles are all, of course kosher: but buy one according to your own ethnic origin. A mezuzah written in proper Sephardic style is considered kosher post factum for an Ashkenazi family. The price of a mezuzah reflects the level of expertise, the attractiveness of the script, and the amount of time invested in its creation. 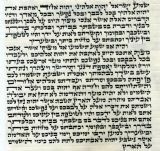 Writing a mezuzah requires one to two hours or more; there is also the expense of a professional proofreader, plus the cost of the parchment itself. For this reason, an exceptionally low price can indicate “shortcuts”, an attempt to dispense with the necessity of a valid receipt, or may even compromise the kashrut of the mezuzah. 5. Men and women are required to affix a mezuzah in their household. The responsibility of making a bracha (blessing) at the time of affixing the mezuzah falls on women as well as men. Only one of the occupants makes the blessing on all the mezuzot of the house. 6. The bracha for the mezuzah is similar to the bracha made when lighting the Chanukah candles- Barukh atah Hashem, Elokeinu, melekh ha'olam asher kidishanu b'mitz'votav v'tzivanu likbo’a mezuzah. Blessed are you, L-rd, our G-d, sovereign of the universe Who has sanctified us with His commandments and commanded us to affix a mezuzah. 7. Where does one place the mezuzah? It is affixed to one’s right as one enters a room, 2/3 up the door post (approx. shoulder level for someone of average height) in each room where there is an entrance. An entrance is defined as an opening to a room where there is “a beam”- a vertical lintel meeting a horizontal beam on the ceiling. The basic preference applies to the entrance from outside. 8. 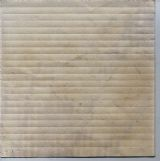 In order to preserve the parchment longer, wrapping it in plastic before inserting it in the “housing” is recommended . 9. Kosher cases may take any form and can be made from any material. At the outside entrance, where the ravages of weather may affect the life of the mezuzah, it is advisable to use a watertight case. 10. While offices and businesses, not being used for habitation, are not required to affix a mezuzah, it is nevertheless recommended to affix them to all doors even in public buildings and offices. In such places it is acceptable to uses less expensive mezuzot, but of course they should be kosher as indicated above.